I'm not vegetarian but I love a great vegetarian meal. 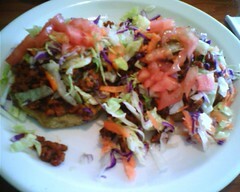 I was intrigued when I heard that a Mexican Vegetarian place was openning up in the Highland Park area. I finally dropped by to check it out. The staff was really friendly. Despite some web posts elsewhere that were critical of the long wait for food, I didn't feel that I waited too long. Perhaps they worked out those kinks over some time. First off, I saw a bunch of interesting smoothies. 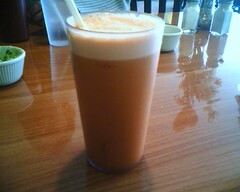 I tried an apple/carrot/cucumber smoothie. Um... this sucker was tasty. Fresh and refreshing! You can taste all the fruit and veggies in one happy union. Now this place does the faux-meat thang. I'm generally not a fan of the faux-meat. When I've had a faux-meat dish, its more for the novelty. I mean, if I wanted carnitas, I would eat real carnitas. I don't need my veggies to look like a piece of meat to enjoy the dish. So at this sitting, I didn't order the "carnitas" or "chicken" or "steak", but I did try the Soy Chorizo Sopes - which were great. 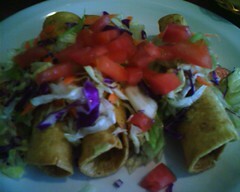 I also tried the Potato Flautas too. These were pretty good too. I was full and didn't even finish these two apetizers. So I'll have to come back to try some other stuff. I've seen some posts about the Chicken Mole - will try that next time. If you have vegetarians/vegans in your group or if you have a hankering for Mexican but want a healthier alternative, this is a good place to check out. I mentioned Fish King in one of my comment replies for a previous post on Seafood City. 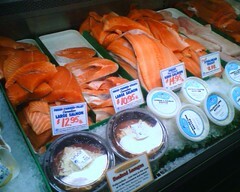 Fish King is where I usually go for fresh seafood. 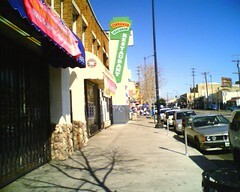 It's a little way off Colorado Blvd in Glendale, but I figured I should give Fish King the props their due. This place is awesome and one of THE places to go for fresh seafood on the east side. One thing I like is that they do clearly display the origin of their product. They also have a "fast food" area where they will grill or fry up many varieties of seafood. It's a great place to go to get a food fix if your not in the mood for cooking. 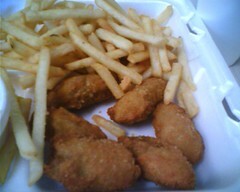 Here is a pic of some fried oysters with fries. They also do platters of sushi, sashimi...etc. for any bigger parties you may be hosting. You'll need to put in a couple days notice but it will be a hit for sure.